I’m feeling overwhelmed, you know. My desk is piled. I’m working so much…my to do list grows and grows, and priorities are hard to make. Reading Pernille today helped me. She says “yet,” and I agree. I’m just not there yet. However, within the beginning of the year stress, there were lovely things about today. There’s that. I wrote with my students today. There’s that. We sliced. My notebook entry “Slice” written in school today. I read with my students today. There’s that. The One and Only Ivan. Then Rain Reign with my second reading class. These are the books they voted on. I warned them we would need tissues. I even made dinner for my family, and took the dog on a walk – with my 13 year-old daughter too. There’s that. The chat with her, I’ll have that every day please. After getting the kids to bed, I did more work. There’s that. I love my job, I love this work. And look! I sliced! There’s that. 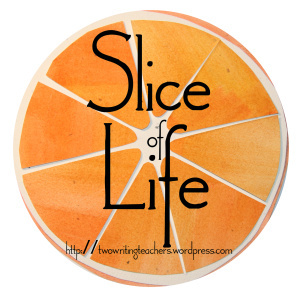 You did slice and that is awesome! Yet was my OLW a couple of years ago. There is so much power behind it! All the little moments create big moments. There’s always more, there’s always extra, and yet, you do it. There’s that.